Click the Service link in table below to order on-line. You will be forwarded to the registration service secure page to complete your order. All possible types of payment from Credit Card to PO Orders are accepted. PayPal payments are available as well. Just select the appropriate payment type in the order form. Volume discounts will apply when ordering more than 4 licenses. ; just activate CD-On-Demand option in the order form. Important: Please make sure you're able to receive emails from ! All registration emails are sent automatically from this address. A minor update is a revision that encapsulates software bug fixes and often includes small functional enhancements. Minor updates are signified by minor version number increments. For example, a minor update from version 3.0 would be 3.0.1, 3.1, 3.2.1 etc. A major upgrade is a revision that involves extensive engineering work to provide significant enhancements to a product. Major upgrades are often accompanied with new documentation and are signified by an increment in the integer portion of the version number. For example, a major upgrade from version 3.0 would be labeled 4.0. Resource Builder registered users are entitled to free minor updates. For example if you are a registered user of version 3.0 you are able to download and use updates labeled 3.0.1, 3.1 etc. Major updates usually incur a some update fee to help cover additional engineering and documentation costs. For example if you are a registered owner of 2.x you will be able to download and update to version 3.0 for a small update fee. 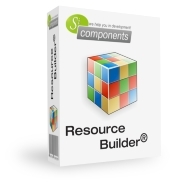 If you purchase a license for Resource Builder and a major upgrade is released within one month of your purchase date you are entitled to a free upgrade to the new major release. If you have any questions concerning software upgrades please send us a message either by email or using contacts form at https://www.sicomponents.com/contacts.html. You can order our products on-line using all possible payment methods including credit cards, wire transfers and others via ShareIt (element 5 AG, Germany) or Plimus Inc. (CA, USA) registration services. All orders are handled through Secure Server connection that ensures your registration information will not be read by unauthorized persons. You can become our affiliate and start earn money referring our products by receiving at least 20% from each sale generated. Just use this link to register and start make money.